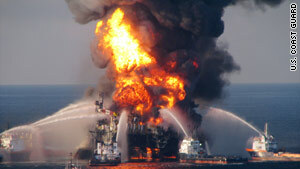 Witnessess reported liquid spurting from the well in the hour before the Deepwater Horizon explosion on April 20. Pressure on drill pipe "unexpectedly increased"
(CNN) -- Oil company BP had three indications of trouble aboard the doomed drill rig Deepwater Horizon in the hour before the April 20 explosion that sank the offshore platform, congressional investigators reported Tuesday. Witnesses reported the well was spurting liquid and pressure tests indicated "a very large abnormality" was occurring aboard the rig, according to a memo released by the House Energy and Commerce Committee on Tuesday afternoon. The memo summarizes preliminary findings of BP's own investigation into the disaster, which left 11 workers dead and uncapped an undersea gusher that has spewed crude oil into the Gulf of Mexico for a month. The well unexpectedly spouted fluid three times in the 51 minutes before the explosion and pressure on the drill pipe "unexpectedly increased" before the blast, the memo states. And the report found that other events aboard the rig "require further inquiry," including an unexpected loss of drilling fluid five hours before the explosion that suggested a leak in the blowout preventer -- a critical piece of equipment that has failed to shut down the well. BP's investigation "raised concerns about the maintenance history, modification, inspection, and testing" of the blowout preventer, the document states. Tuesday's report comes amid growing pressure on BP -- which is responsible for capping the well and cleaning up the spill -- and on the Obama administration, which is overseeing the cleanup. BP put equipment in place Tuesday for a new effort to cut off the flow of oil, using a procedure that has never before been attempted in mile-deep water. The company plans to pump 50,000 pounds of thick, viscous fluid, twice the density of water, into the site of the leak to stop the oil flow and then seal the breach with cement. And the Interior Department's inspector general reported Tuesday federal inspectors from the Minerals Management Service, which oversees oil drilling in the Gulf of Mexico, accepted meals and tickets to sporting events from companies they monitored. The period covered in the report is well before the April explosion, but acting inspector general Mary Kendall said that she pushed for the report's early release in the wake of the disaster. BP, rig owner/operator Transocean Ltd. and oilfield services contractor Halliburton have all blamed each other for the disaster. More congressional hearings into the Deepwater Horizon sinking are planned this week, and the Coast Guard-Minerals Management Service probe into the disaster is scheduled to open four days of testimony on Wednesday in suburban New Orleans, Louisiana. Among the witnesses slated to appear in the Louisiana proceedings are Curt Kuchta, Deepwater Horizon's captain, who is on the witness list for Thursday. And President Obama will travel to the Gulf Coast on Friday to review oil spill response efforts, the White House announced Tuesday. It will be Obama's second trip to the area since the explosion, after a May 2 helicopter tour and meetings with local fishermen affected by the spill.